If you’re like most psoriasis sufferers, you’ll have tried just about every cream, lotion, pill, and spray to relieve your symptoms. Maybe they help a little, but you still itch and flake your way through life. But there is an oil that might just help: hemp oil. I’m not going to claim that hemp oil can cure your psoriasis. We have yet to find a cure for psoriasis or understand exactly its cause. However, hemp oil may well be the thing that helps you to manage the symptoms. Some of the symptoms hemp oil psoriasis treatment can ease are the itching, inflammation, and lesions. Although some research has been done on the use of hemp oil to treat psoriasis, there are still large gaps in our knowledge. Several studies have been positive and found that hemp oil psoriasis treatment is indeed a possibility, but there are no medications just yet based on hemp oil. However, you can find a lot of personal reports from psoriasis sufferers who have tried hemp oil, and most found that it eased their symptoms quite quickly and without side effects. Let’s start at the beginning. What is hemp oil? It is an oil made from seeds of hemp plants – and it will not get you high (let’s get that out of the way right now). Sometimes, other parts of the hemp plant are used in the oil as well. The oil contains the wonderful essential fatty acids that our bodies need as well as high-quality proteins and vitamins. So let’s have a look at those essential fatty acids. They are called essential because we need them, but our bodies cannot make them. In our bodies, essential fatty acids help to manufacture and repair cell membranes, and they play a role in regulating heart rate, blood pressure, blood clotting, and immune function. Two common types of essential fatty acids are linoleic acid (also called Omega 6) and alpha linolenic acid (Omega 3), and hemp oil happens to contain those essential fatty acids in an optimal ratio for our bodies. On top of that, hemp oil also contains gamma-linoleic acid (sometimes called Super Omega 6). Omega 3 is known to play a role in reducing the inflammation that is associated with psoriasis. The inflammation causes itching, pain, and other problems for the skin, and Omega 3 can help reduce this inflammation. Several scientific trials with oils containing Omega 3 have been shown to be beneficial in the treatment of psoriasis. Gamma-linolenic acid is also known to reduce inflammation in the body and so is also helpful in the management of psoriasis. There are different products containing hemp oil that you can use to manage psoriasis. You can use it in food, apply it to your skin, or use a soap or shampoo with hemp oil. You can pick and choose, or try all methods; it’s up to you. Hemp oil is safe and has very few side effects, but as with any treatment, consult with your healthcare provider first. You’ll be pleased to hear that the oil has a nutty flavor that is suitable for use in a number of recipes, including salad dressing. Just whisk together some lemon juice or vinegar with hemp oil, add some salt or soy sauce, and you have yourself a wonderful, medicinal salad dressing. Other ways of using hemp oil are to just take a teaspoon or two straight up, add it to your breakfast cereal or smoothies, or add it to your dinner. You shouldn’t fry with hemp oil, though; it loses quality and flavor if it’s heated above 160 degrees Fahrenheit. Always store your hemp oil in the refrigerator, and use it within six months. There are also a number of cannabidiol products that you can use. Cannabidiol, or CBD, is one of 85 natural substances found in the cannabis plant. Like hemp oil, CBD will not get you high as it does not contain THC, the intoxicating substance found mostly in the hemp flowers. 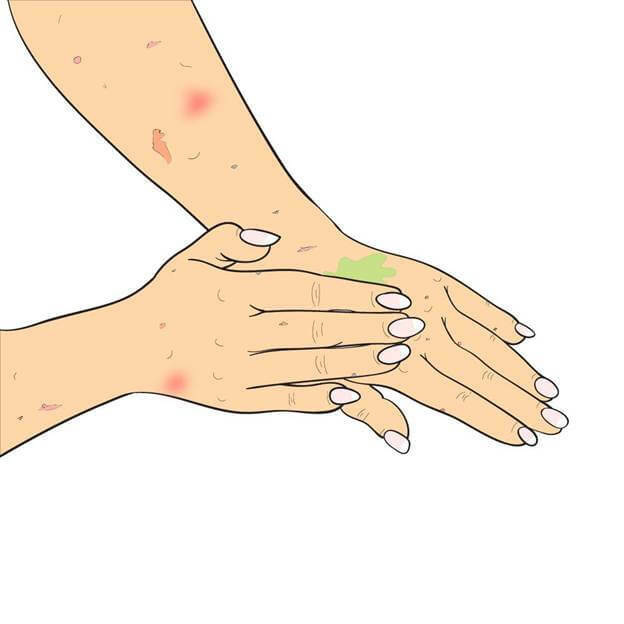 There are cannabinoid receptors throughout your body, including in your skin, and early studies are positive about the possibility of using cannabinoids to treat a variety of skin diseases, including psoriasis. CBD tinctures, which you can add to a drink or just take straight. Tinctures or drops make it easy to tailor the dose to your needs. You can even buy drops for your dog! CBD capsules can be taken like any dietary supplement and generally have larger doses than the tinctures. CBD vaporizers, which heats the CBD to the point at which it turns into vapor, which is quick acting. There are a number of hemp oil skin products, such as lotions, creams, and salves. Hemp oil’s essential fatty acid profile is very close to our own skin lipids, which means it is able to penetrate your skin and lubricate the surface between cells – and it does this without clogging your pores. Furthermore, the essential fatty acids help to reduce inflammation. Many psoriasis sufferers have reported that CBD topicals work better to ease itchiness, inflammation, and plaques than topicals without hemp oil. Another benefit of using hemp oil on your skin is that it naturally provides mild UV protection and has antioxidant properties. You can also add hemp oil to your hygiene routine. Many soaps and body washes dry out your skin, so using hemp oil products instead is very beneficial for psoriasis sufferers. If you have psoriasis on your scalp, a hemp shampoo is recommended. Hemp shampoo moisturizes your scalp and hair, stimulates hair growth, and strengthens your hair. I think you now get the idea that there are a number of options when it comes to hemp oil psoriasis treatments. Now it’s back to you. We’d very much like to hear about your experiences with hemp oil to manage psoriasis symptoms. Which product did you use? How quickly did it work? Did you find one product working better than others?